Mark Scarborough is the owner of Gungahlin business My Gungahlin and Dainere's Rainbow ambassador. 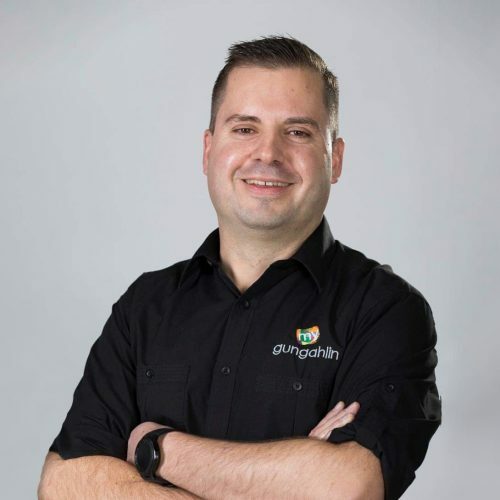 Mark Scarborough is the owner of Gungahlin business My Gungahlin. My Gungahlin is devoted to providing news and information to those that, live work and play in the Gungahlin region. Mark first found out about Dainere’s story after her passing when herself and Jarrett were named Young Canberran Citizens of the Year in 2013. Having also met another local Gungahlin family that lost their son, Benny to a brain tumour Mark felt compelled to help raise awareness and funds for research to find a cure for this disease. “I am honoured to be entrusted by the Anthoney family to be given the privilege of being named as Ambassador for Dainere’s Rainbow Brain Tumour Research Fund. I have been amazed at the determination this family has in honouring Dainere’s final wish to find a cure so no other child will suffer from this disease.